Cure what ails your ill-fitting receiver set or just spruce them up with high-quality new look. 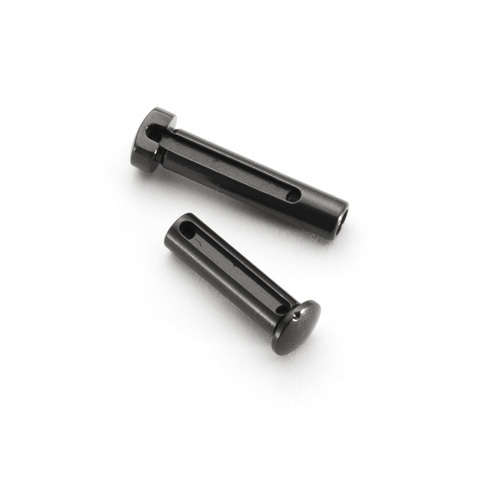 This set of MicroFit Takedown Pins includes both the front pivot pin and rear takedown pin for a small-frame receiver set. Select your pin size at right. Oversized pins will remove much if not all of the slack in a loose receiver set while undersized pins will help with easier takedown of overly tight receivers like those with excess finish buildup. To gauge the pin fit for your third-party receivers, you can use standard takedown pins or gauge pins. For the AR-15, Mil-spec pins are roughly equivalent to a .248 gauge pin. Oversized and undersized MicroFit Pins are offset slightly over .001 larger or smaller. Because test fitting of takedown pins is likely to produce wear marks, we cannot accept returns on MicroFit Takedown Pins.